UniSysCat (Unifying Systems in Catalysis) involves senior and junior researchers from the four universities in Berlin and Potsdam, the Charité, and the research institutes FHI, MPI-KGF, HZB, and FMP, providing expertise, methods, and approaches from molecular and structural biology, biochemistry and biophysics, chemical synthesis, physical and theoretical chemistry, and physics, as required for a highly interdisciplinary program. During the ten years of successful research within UniCat, we have learned to master the challenge of combining researchers from quite diverse disciplines and different institutions in a team and focusing their efforts to solve key scientific questions. The UniSysCat team includes 25 principal investigators (PIs) (24% women) and further scientists with specific, indispensable areas of expertise (see Research Units A - E). It will be further complemented by additional professorships that will be either newly established or dedicated re-appointments to fill the gaps in expertise for novel challenges in catalysis research and to ensure continuity in key methodologies. The central scientific objective of UniSysCat (Unifying Systems in Catalysis) is to master the next stage of future challenges in catalysis: how to elucidate, create, and control reaction networks in chemical and biological catalysis at different levels of complexity in space and time. The UniSysCat team includes 25 principle investigators (PIs) (24% women) and further scientists with specific, indispensable areas of expertise (see Research Units A - E). 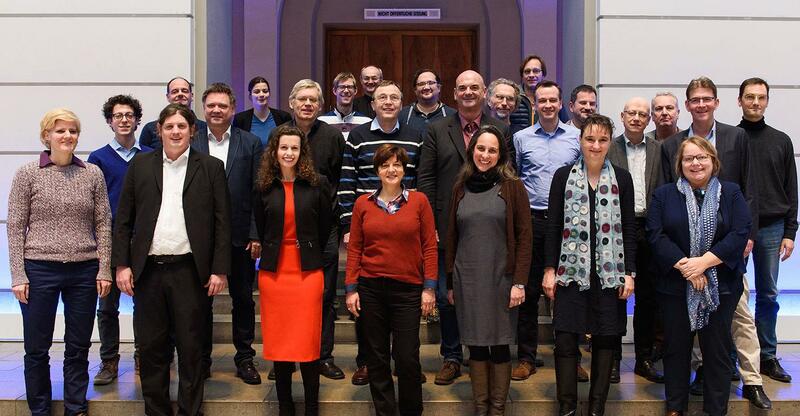 The core group of UniSysCat with four universities in Berlin and Potsdam and the FHI and MPI-KGF of the Max Planck Society has collaborated for more than ten years in UniCat and a number of CRCs. New partners of the consortium are the Charité with its expertise in structural biology, the FMP, contributing its NMR facilities and expertise, and the HZB including its synchrotron source BESSYII, a particularly important infrastructure for developing new approaches in protein spectroscopy and the in situ analysis of catalytic processes. As in UniCat, UniSysCat will be involved in a variety of national and international collaborations. This concept will now be developed towards a higher level of scientific interactions, i.e., from bilateral collaborations with individual institutions to ‘network of networks’, including mutual exchanges of researchers and ultimately aiming at joint research projects. Particularly important is the expansion of the collaborations with other research networks in Berlin. These interactions will be promoted by the Einstein Center for Catalysis (EC2) and include other research clusters such as NeuroCure and Matheon (MATH+), as well as CRCs in chemistry and life science.